Tonight is the peak of the second meteor shower of October, the Orionids. Since the moon is just past full and has been incredibly bright, it’s unlikely we’ll get to see any shooting stars, but that doesn’t mean we can’t harness the energy of the shower in our magickal workings. October’s full moon is often called the hunter’s moon, because its light aided hunters in tracking their prey on autumn nights, enabling them to bring home enough game for the winter months ahead. The Orionids fly from the constellation Orion, the greatest hunter in ancient Greece. At the same time as the full hunter’s moon, they give us powerful energy to work with. 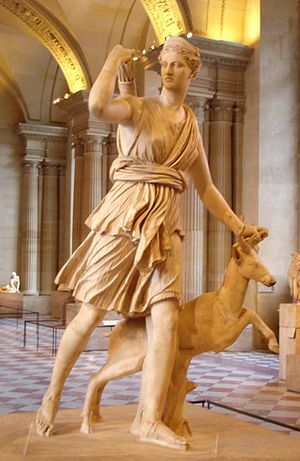 Orion was the hunting companion of the goddess Artemis until he was killed by a giant scorpion. Artemis is the goddess of hunters and the wild things, as well as the goddess of the moon. She is the protector of animals and children and defends the powerless, especially women, against unjust treatment. If you are in need of courage in the face of unfair dealings, protection for animals or children, or aid while hunting responsibly, call on Artemis and Orion tonight. It’s even better if you head outside, where the wild things are, and talk to Artemis directly. Ask nicely, because she’s a tough lady who expects respect. A small offering of thanks will keep you in her good graces. I’ve had clear nights to enjoy October’s full moon, but I have to admit the addition of the frenetic Aries energy has made it an interesting ride for the past few days. It’s definitely hasn’t been a good time for catching up on sleep. Now that the moon has transitioned into Taurus, maybe I’ll get some rest. If you haven’t seen this beautiful moon yet, I hope you have a cloudless sky tonight.